Good fortune? Yes, please! | Create! All of this is to say: I have good reason to feel fortunate. When the holidays were approaching and I still wasn’t getting better, it was sad to think of spending my first Christmas away from home, and worse than that, in the hospital getting tests done. Even with frowny lump of coal in tow, not even look-on-the-bright-side Alicia could have turned Christmas-in-the-hospital around. (Okay, maybe I would have written an adventure story for frowny lump of coal amidst all the wires, needles and beeps, but I wasn’t looking forward to tapping into even more creativity via melancholy and soaking my notebook with tears). Luckily, I started to feel “well” enough to make the trip to Pittsburgh (and did NOT have to go to the hospital YAY YAY YAY! ), and continued to get better and better while in Pittsburgh. 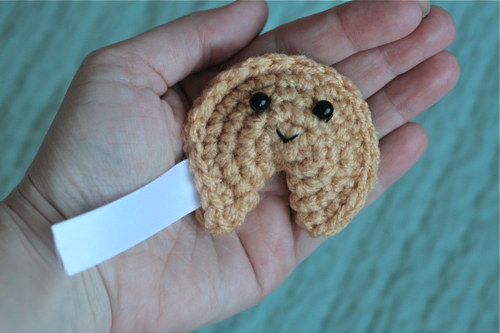 Big “phew.” While there, I got the idea to crochet a fortune cookie, based on some felt ones I saw in Martha Stewart last year. I bought a fortune cookie at the mall food court so that I could match the color of the real thing to appropriate yarn, and lo and behold, the fortune was perfectly relevant! (Have you noticed that most fortunes aren’t really…fortunes? More like declarations). It reads: “You have a deep interest in all that is artistic.” And there was a smiley front at the beginning and end of this sentence. T’is true! Ha. Fold in half and sc together until there are 4sc left. Sl to next sc and finish off. Pinch the cookie at the center, and with long tail and tapestry needle, sew across the (2sc, sc) round on the bottom side to “gather” the yarn a little and keep the pinched part in place. With embroidery floss, sew on two beads along the (2sc, sc, sc) round, spaced about 3sc apart. Sew on a tiny mouth one round below. Cut a 2.5-inch piece of white ribbon and sew onto the inside of the cookie. Ta-da! May good fortune follow you everywhere, i.e. put him in your pocket STAT! This is a wonderful post, your year was fabulous! I love the mix of craft, fun and adventure. And the fortune cookie is adorable. Thanks so much, I’ll be linking. I wanted to pass along this link I came across for custom printed fabrics. I can only imagine what you would do with safety cone themed fabric! Congrats, Alicia — looks like you have a lot to look forward to in 2010! Good luck with everything! Love these fortunes! Thanks for sharing about your year. Also enjoyed the Salinger post. Great point, one more people should have made! Wow, Elizabeth, I’m intrigued about your party! OMG! How sweet and totally appropriate for a Valentines Day that falls on the first day of Chinese New Year! I wish you good fortune Alicia!!!!!!!!! 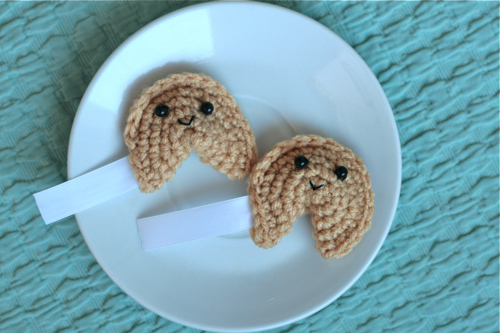 i DIG these fortune cookie crochets!!!! so great to meet you last night btw! Please tell me where to purchase this yarn. 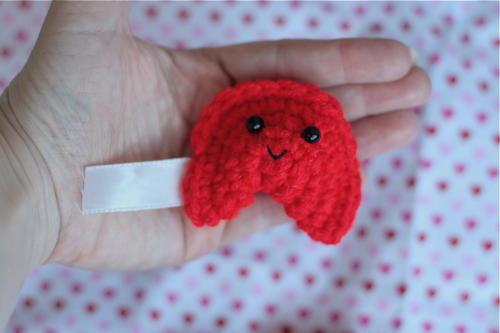 I would love to get srttaed making lots of squares to donate to this project. I tried to locate where I could get some of this yarn sent to me but cant seem to find a good site.Thanks so much. I look forward﻿ to helping!!! F*ckin’ tremendous issues here. I’m very happy to see your article. Thank you a lot and i’m having a look ahead to contact you. Will you please drop me a e-mail? 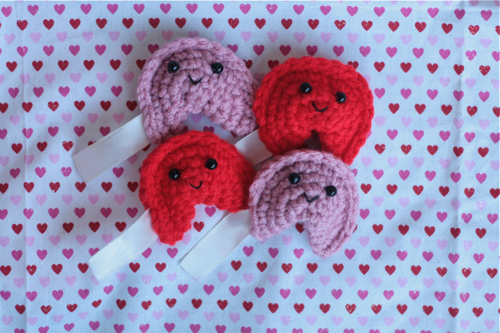 Call for *smiling* white blood cells!